The future envisioned by Jules Verne and A. G. Wells never quite came to pass. 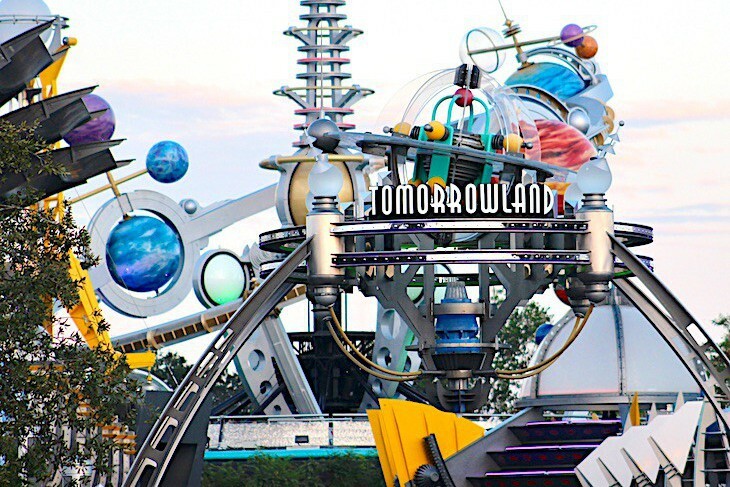 But in Tomorrowland® that dream still exists. It’s as if you’ve been plunked down into a Jetson cartoon within a metallic, futuristic city of unbending metal palm trees, bizarre stainless steel towers straight out of Flash Gordon, ultra-modern seating topped with colorful but stiff umbrellas, and angled store fronts blazing with neon lighting. Populated by robots and aliens, here is a place where time travel certainly seems possible. 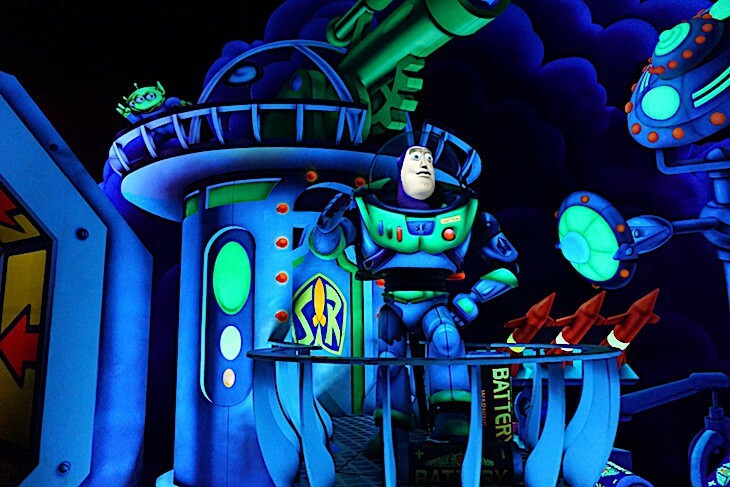 Battle the evil Emperor Zurg using your joystick and laser canon to blast away at any and all targets. Populated by robots and aliens, here is a place where time travel certainly seems possible. 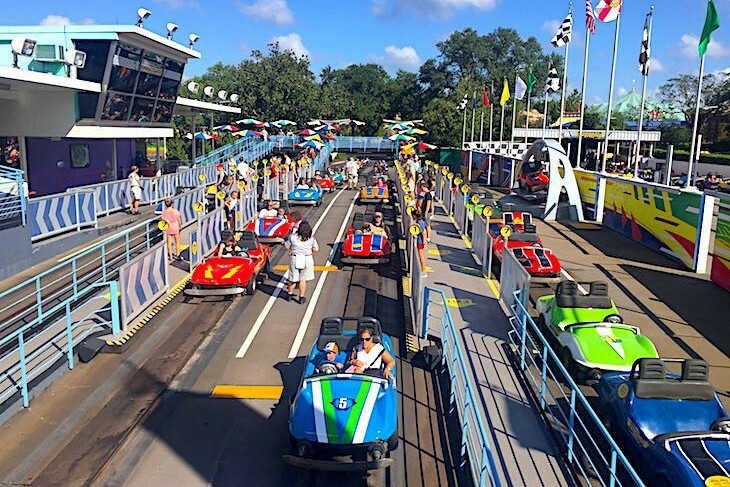 Kids love this ride, but if you don't have any in tow you may want to steer clear of the lines and exhaust fumes. 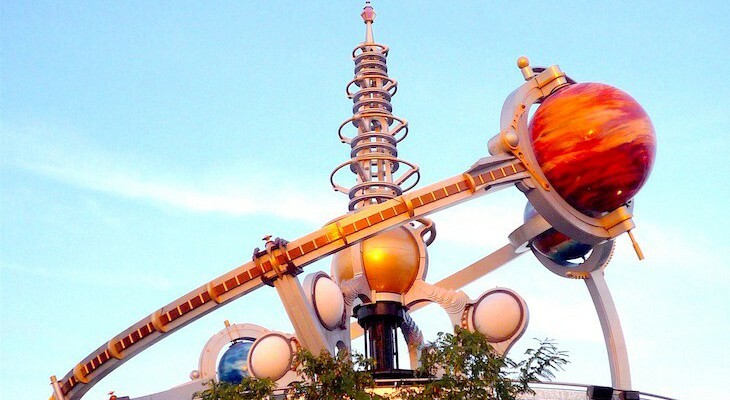 Tomorrowland’s180-foot, conical-shaped “mountain” is one of the most popular attractions in the park, a cosmic roller coaster shooting through the darkest depths of the solar system. Load into six-passenger, single-file rockets before blasting into orbit and plunging through an almost pitch-black interior filled with sparkling comets, shooting stars, and glowing planets. Look closely to spot the other coaster ripping around on the second track. 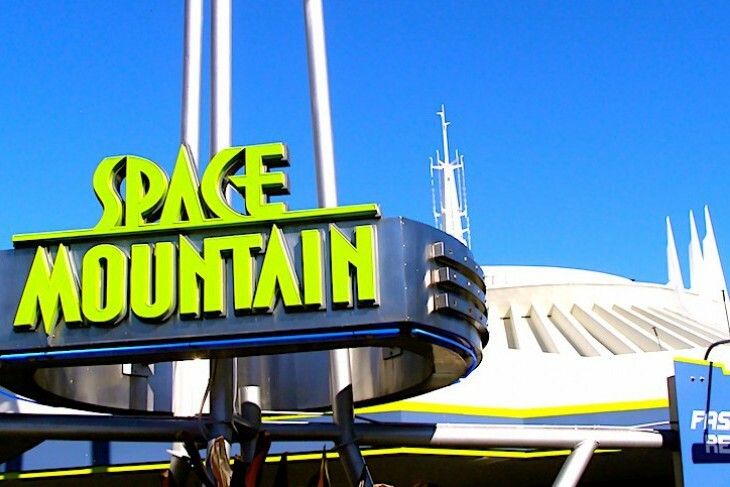 An interactive queue area helps pass the time during your wait, and a super audio system only serves to enhance this blast (pun intended) of a ride. Moving along at only 28 miles per hour there are only small drops and no loops or twists; it’s just the darkness that makes it such a thrill. 2 1/2-minute ride. Minimum height: 44 inches. Not recommended for expectant mothers, those with back or neck problems, or those prone to motion sickness. Cara's Tip: Lines can sometimes be extremely long. Come first thing in the morning or before park closing. And hang onto your valuables or risk losing them in the deep, dark vastness of space.